Content curation is the process of sorting through the vast amounts of content on the web and presenting it in a meaningful and organized way around a specific theme. The work involves sifting, sorting, arranging, and publishing information. A content curator cherry picks the best content that is important and relevant to share with their community. It isn’t unlike what a museum curator does to produce an exhibition: They identify the theme, they provide the context, they decide which paintings to hang on the wall, how they should be annotated, and how they should be displayed for the public. Content curation is not about collecting links or being an information pack rat, it is more about putting them into a context with organization, annotation, and presentation. Content curators provide a customized, vetted selection of the best and most relevant resources on a very specific topic or theme. As Rohit Bhargava points out in this post via Robin Good, a content curator continually seeks, makes sense of, and shares the best and most relevant content on a particular topic online. Content curators have integrated this skill into their daily routine. Why is Content Curation Valuable? People and organizations are now making and sharing media and content all over the social web. For example, on Facebook the average user creates 90 pieces of content each month. If you multiply that by the 800 million Facebook users, it isn’t surprising that data or content on the Internet is measured in exabytes, or billions of gigabytes. Simply put, we are living an era of content abundance. A content curator offers high value to anyone looking for quality content because finding that information (and making sense of it) requires more and more time, attention, and focus. What does that mean for nonprofits and the people who work for them? I think there are many benefits for both individuals as well as the organization. For some staff members, content curation can be professional of learning. Professional development used to be about getting trained or acquiring a specific skill. But, with so much information available and coming at us from many sources, we often don’t know if it’s the right information or if it’s current. And depending on our field, it can get out of date quickly. In today’s world of content abundance, the skill of how to find, make sense, and share content that we need to be effective in our work is critical. Simply put, being a content curator is a method to help you stay informed about your field and be more effective at your job. The biggest challenge to becoming a content curator is getting past the feeling of “content fried” or so much good content and so little time to digest it. There are techniques that we can use to minimize feeling distracted and with some discipline make it of our work flow. For organizations and brands, content curation can help establish the organization’s thought leadership and capture attention in today’s information cluttered world. Content curation can help your organization become the go-to authority on an issue or topic area. It can be done as simply as writing a blog post with links or sharing annotated links on Twitter around your topic. Take for example, how Bruce Lesley from First Focus uses Twitter to establish authority as a content curator on children welfare issues. The key principles of content content creation for a brand are outlined in this article “Become A Content Curation King” – what is most important for nonprofits that want to get started is consistency, knowing your audience, and identifying your topical niche. It is also important to understand that content curation is NOT just about information, it is about feeding and tuning your network as Howard Rheingold notes. 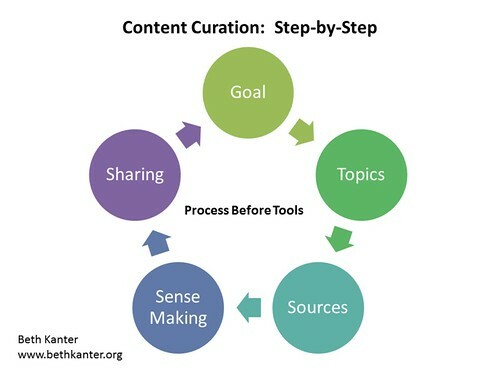 Content curation is a three-part process: Seek, Sense, and Share. Finding the information or “seeking” is only one third of the task as Mari Smith points out in this video about why curation is important and some tools for doing it. Making sense of the information is just as important. Sense making can be a simple as how you annotate the links your share, the presentation, or what you’ve left out. Sense making can be writing a blog post using the links (like this post) or summarizing the key points in a presentation. However you create meaning, but it has to support your organization’s communications objectives or your professional learning goals. Finally, the sharing – is about giving the best nuggets of content to your audience in a format that they can easily digest and apply it. Putting content curation into practice is part art form, part science, but mostly about daily practice. You don’t need to do it for hours, but a little bit everyday will help you develop and hone the skills. It is best to do the seeking part in small bursts to avoid feeling overwhelmed. 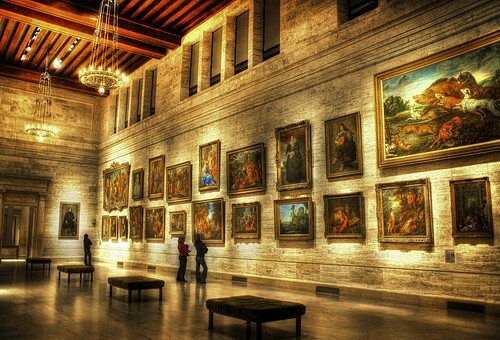 One way to be effective is to find the best curators your topic and follow them. It is like sipping fine wine. You have to be organized and know your sources. And you have to scan your sources regularly and thank them. It is also good to learn from experienced curators and how they hone their craft. Netsquared recently published this summary of tips from nonprofit content curators. You can also learn a lot by looking at the work flow of “master curators” like Robin Good, Howard Rheingold, and Robert Scoble. Use this questionnaire to help you think through a plan for content curation before you dive into the curation tools. There has been an explosion of tools and you can distracted by useless features. Even better, perhaps focus on the skills with the tools you know how to use already. You might want to integrate the process of content curation into a channel you’re already using. Next, you might want to expand to using a couple of the new tools that are specifically designed for content curation. Here’s a few curation tools that are easy to get started. Storyfy — Storify is a way to tell stories using social media such as Tweets, photos and videos. You search multiple social networks from one place, and then drag individual elements into your story. You can re-order the elements and also add text to give context to your readers. I use storify if I want to capture conference sessions. Here’s an example from Zan McColloch Lussier using storify to capture the conversation from a panel “Good Grantmaking: What’s Social Media Have To Do With It?” A quick tutorial on how to use it. Scoop.It – (beta, invite-only) — Scoop.it is a terrific tool for discovering those super nichey, hidden gems relevant to specific topic. Use the dashboard to manage an unlimited amount of sources (websites, RSS feeds, specific social media accounts, etc.) and plug in relevant keywords and date parameters. Scoop.it does the rest and delivers you a constant feed of exactly the type of content you’re looking for. Here’s my scoop.it lists as well as the lists by some of my favorite curators there. Amy Sample Ward has a review of Scoop.it here. BagTheWeb — BagTheWeb helps users curate Web content. For any topic, you can create a “bag” to collect, publish, and share any content from the Web. Beyond most curation tools’ capability, BagTheWeb enables users to build networks of bags. This way bags can be linked together to provide rich and complete information about any topic. Susan Kistler has an example with evaluation resources. Pearltrees — An extremely powerful tool that aids discovery of new, relevant content by presenting it in a very visual way. The interface builds a hub-and-spoke style tree diagram of content that you search for, discover and collect. Hover over new “pearls” to see at-a-glance previews of the content which you can then “pick”, comment upon, and share. Susan Kistler has curated this list on Evaluation. What are your questions about content curation? Thanks for sharing this. Curation is a mindset shift. We go from searching to selecting.